Maurizio Sarri insists he is not better than Jose Mourinho because the under-fire Manchester United manager has won "everything everywhere" in his career. 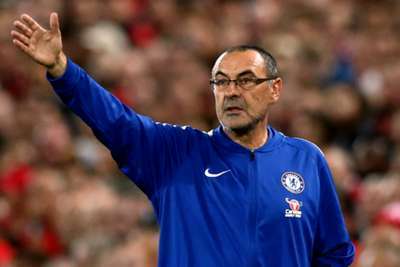 Sarri’s Chelsea host Mourinho and United at Stamford Bridge on Saturday aiming to maintain an unbeaten start to the Premier League season that means they sit behind leaders Manchester City only on goal difference. The Italian coach has quickly made his mark on English football since his arrival from Napoli, with his attacking style of football not only winning over his own club’s fans but also many neutrals. By contrast, United are seven points worse off than their next opponents and Mourinho has come under significant pressure following a difficult start to the campaign, media reports prior to the international break even suggesting the Portuguese was going to lose his job. Yet despite the speculation over his future and a string of disappointing results, Mourinho's achievements in the game are more than enough to earn the respect of the current Blues boss. When asked if he rates Mourinho as a better coach than himself, Sarri told reporters: "Of course. "The results speak for him, I think. So, at the moment, he is better than me, for sure. I hope to improve myself in the future, but at the moment I have to say he's better than me. "I think he is different. I think that I have my character, and my character probably is different to his character. So, I have to be myself, always, otherwise I am not credible. "He has won everything everywhere. So, I need to win if I want to compare myself to him. At the moment, that's not possible. "You are talking about one of the best coaches in the world, and I'm not at the moment one of the best." Much of the criticism aimed at Mourinho this season has centred around his failure to get the best out of several of his leading players, as well as the team's overall style of play. However, Sarri thinks whether United play an attractive brand of football is irrelevant, considering the success he has enjoyed through the years. "The problem is not the way of football, if I like it or not. The focus is on if he is able to win. He has won everything everywhere, so probably that means he is right," he continued. "I think he will be able to win also in the future, because he is really one of the best, maybe the best. The results are the best. I think he will be able to win again."